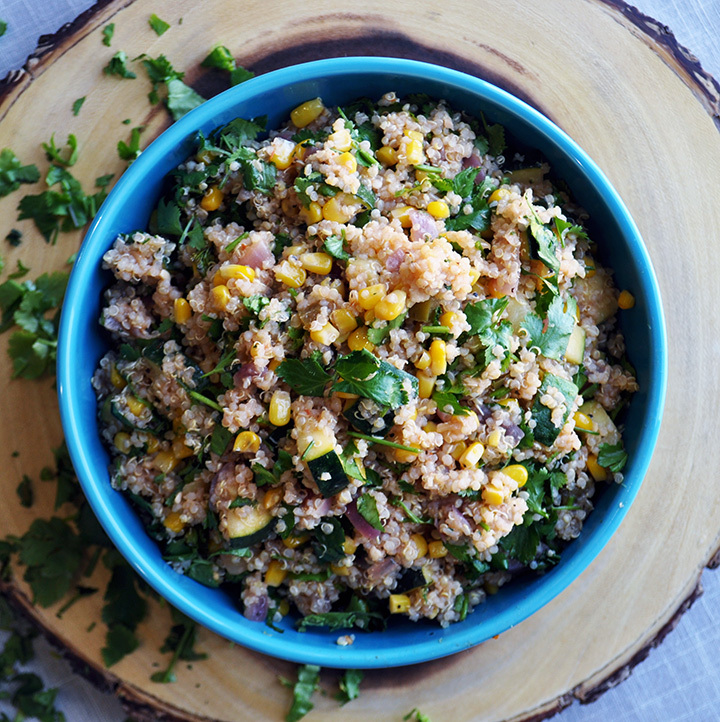 This fresh tasting, light Southwest Quinoa Salad is packed with fresh vegetables, black beans, corn, fresh lime, and cilantro. 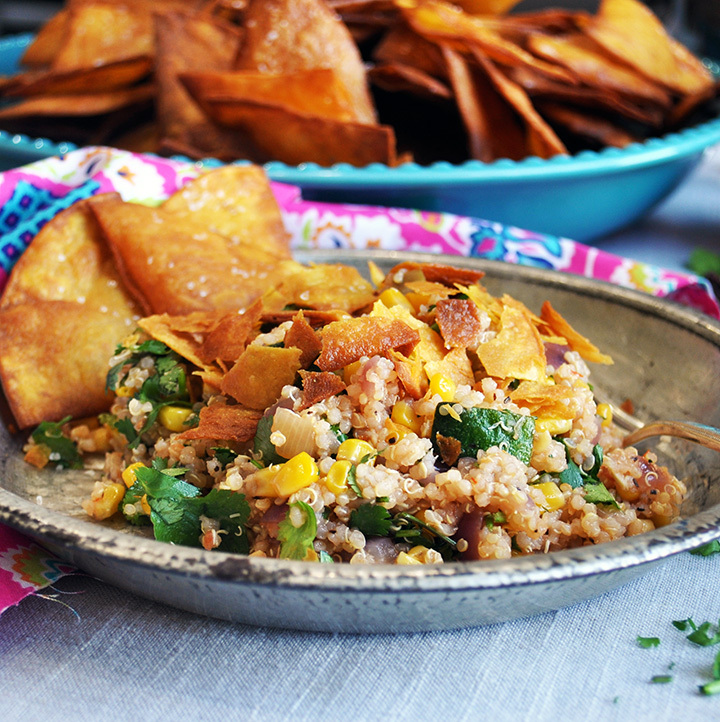 Serve with a crumble of tortilla chips for a little crunch. As I type this, I’m thinking that a cup or two of cherry tomatoes, sliced in half, would be absolutely delightful in this quinoa salad. It’s not something I thought to add when creating this recipe, but consider adding them at the end, with the cilantro. I bet they are delicious in there. This is one of those salads in which many vegetables would be welcome. I love recipes like this, because it allows me to use up lone veggies in my refrigerator. Add some shredded carrot, thinly sliced radishes, or sliced green onions along with the cilantro. Throw some diced bell peppers or yellow summer squash into the skillet with the zucchini. If you’re making this as a part of Spring Meal Plan #3, you should have plenty of leftover cooked quinoa in your refrigerator reserved from the Rosemary Braised Steak Tips with Quinoa that you made earlier this week. You might also still have some leftover roasted red peppers and asparagus. Chop them into small pieces and add them to the salad along with the black beans and quinoa. 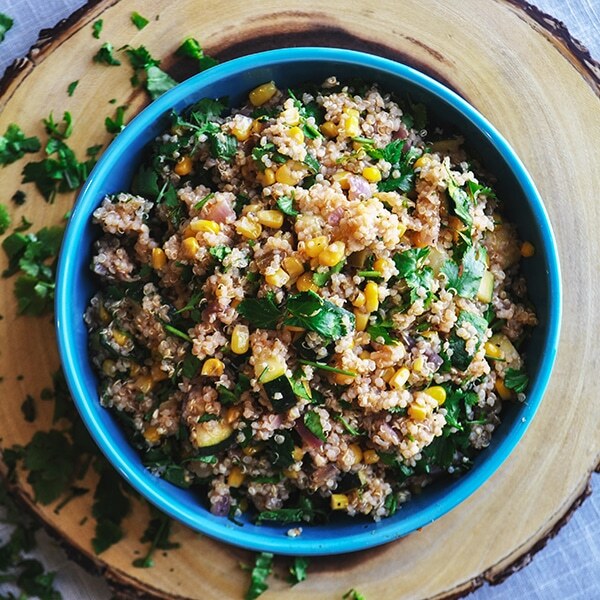 If you’re not making this as a part of Spring Meal Plan #3, cook the quinoa before you begin on anything else in this salad: Bring 2 cups of water or broth and 1/2 tsp salt to a boil in a medium size saucepan. Add 1 cup dry quinoa (any variety), turn the heat to low, cover and let simmer gently for 15 minutes. Remove from the heat and let sit, covered, for 5 minutes longer. Fluff with a fork and let cool completely before using in this salad. 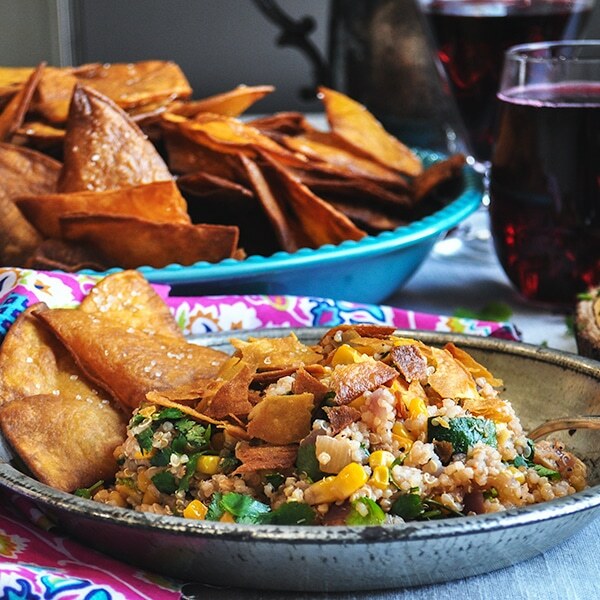 Note: A bag of tortilla chips can be used instead of making homemade chips. If you are making homemade chips, plan on making enough for at least 6 chips per person. 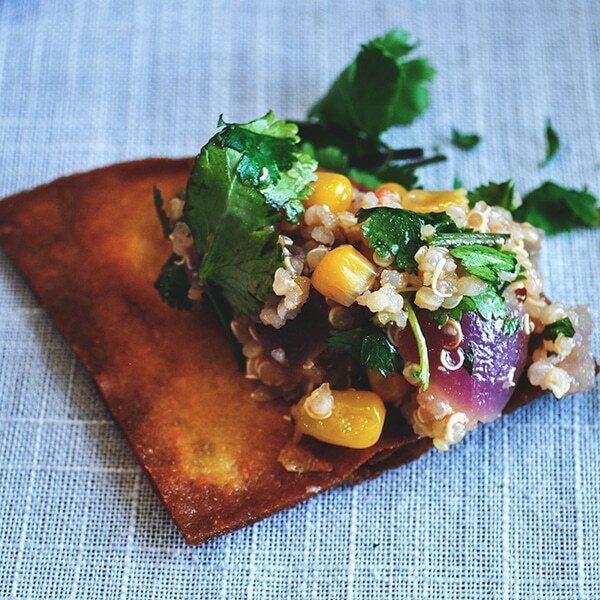 Since each corn tortilla makes 4 chips, you’ll need 6 tortillas for a family of four. BUT – I strongly suggest you make more than that because while you’re cooking them, your family will come along behind you and sneak a few. Who are we kidding? You will too. Add the oil to a large, deep saucepan or frying pan and place over high heat. You want to heat the oil until a small piece of tortilla placed in the oil begins to sizzle immediately, about 350°F. Be careful to not allow the oil to get so hot that it smokes. If that happens, move the pan off the heat immediately and allow to cool down slightly before placing it back over the heat. Adjust the burner heat as necessary to maintain the temperature. While the oil is heating, cut each tortilla into 4 triangle shaped wedges. Line a baking sheet with a couple of layers of paper towels and have a small dish of salt near by. When the oil is hot, add a handful of tortilla wedges – enough to cover the bottom of the pan, but not so many that they are laying on top of each other. Fry the chips for 2-4 minutes, until they are a deep golden brown. Using tongs, quickly remove the chips from the oil and onto the paper towel lined baking sheet. Immediately sprinkle with some salt. Repeat with the remaining tortilla wedges. Put the frozen corn in a colander placed in the sink. Run cool water over the corn to defrost slightly and separate the kernels. Let sit in the sink to drain. Heat 1 tbsp olive oil in a large skillet over medium-high heat until shimmering. Add the diced onion and sauté until just starting to brown. Add the zucchini and sauté for another minute or two, until crisp tender. Add the garlic, salt, pepper, and corn. Cook, stirring constantly, for 1 minute longer. Remove from the heat and dump the mixture into a separate bowl. Stir in the black beans and quinoa, allow to cool to room temperature, then stir in the chopped cilantro. *While the mixture cools, make the dressing. In a medium size bowl, whisk the lime juice, vinegar, salt, and pepper. Slowly pour in the olive oil, in a thin steady stream, while whisking constantly. Whisk in the salsa. Taste and add more salt, pepper, or salsa if you like. 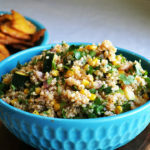 When the quinoa salad has cooled to room temperature, toss with about 3/4 of the dressing. Taste to see if you want to add in the remaining dressing, or if it’s good as is. 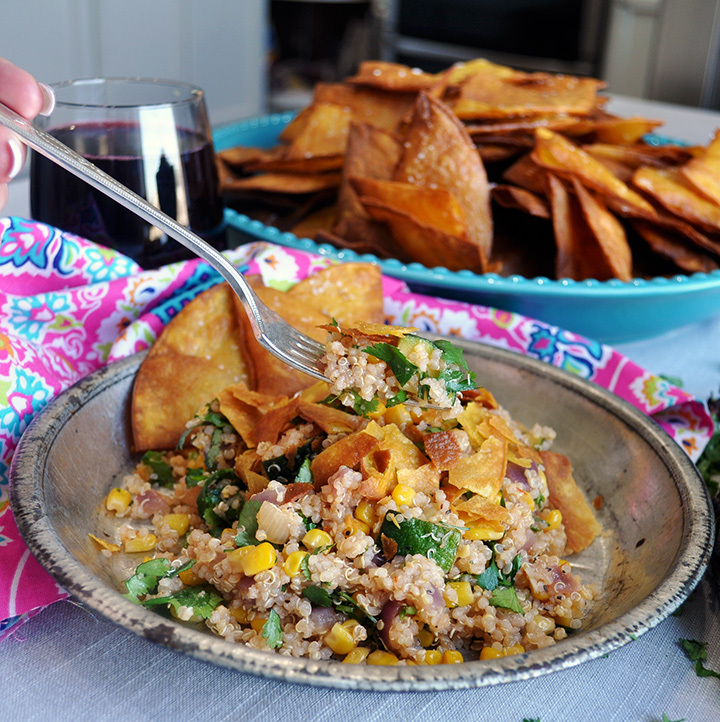 Serve with tortilla chips for crumbling over the salad.